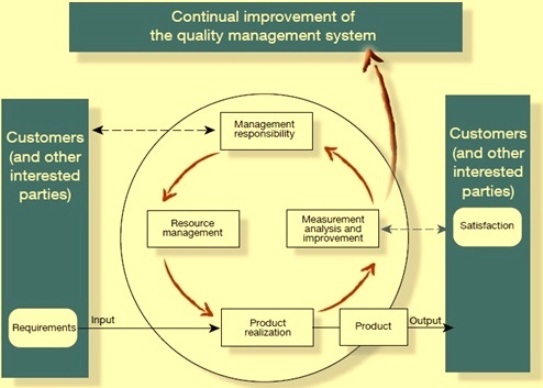 Quality management system (QMS) is a set of coordinated activities to direct and control an organization with regard to quality in order to continually improve the effectiveness and efficiency of its performance. QMS is structured around interlinked processes that provide the necessary implementation controls to ensure customer and regulatory requirements are met, and continual process improvement occurs. The main thrust of a QMS is in defining the processes, which result in the production of quality products and services, rather than in detecting defective products or services after they have been produced. QMS is a business asset to an organization since it has a major impact on the financial performance of a business, its exposure to risks, and employee’s morale. It also gives confidence to an organization with respect to its ability to produce and provide products that fulfill the needs and expectations of customers and external stakeholders. QMS follows process approach as shown in Fig 1. Quality management system is based on eight quality management principles. These principles are used as a guide for an organization to improve its performance. These eight principles are described below. Principle 1: Customer focus – Organizations depend on their customers and therefore should understand current and future customer’s needs. They should meet customer requirements and strive to exceed customer expectations. The key benefits of customer focus are (i) increased revenues and market share obtained through flexible and fast responses to market opportunities, (ii) increased effectiveness in the use of the organizational resources to enhance customer’s satisfaction and (iii) improved customer loyalty to repeat business. Principle 2: Leadership – Leaders establish unity of purpose and direction of the organization. They create and maintain the internal environment in which people can become fully involved in achieving the organization’s objectives. The key benefits of leadership are (i) motivation of the employees and their understanding of the organization’s goal and objectives, (ii) evaluation of the activities and their alignment and implementation in a unified way, and (iii) minimization of the miscommunication between different levels of the organization. Principle 3: Involvement of people – People at all levels are the essence of an organization and their full involvement enables their abilities to be used for the organization’s benefit. The key benefits are (i) motivated, committed and involved people within the organization, (ii) innovation and creativity in furthering the objectives of the organization, (iii) accountability of people for their own performance and people’s participation and (iv) contribution to continual improvement. Principle 4: Process approach – A desired result is achieved in more efficiently when activities and related resources are managed as a process. The key benefits are (i) lower costs and shorter cycle times through effective use of resources, (ii) improved, consistent and predictable results, and (iii) focused and prioritized improvement opportunities. Principle 5: System approach to management – The effectiveness and efficiency of the organization in achieving its objectives are enhanced by identifying, understanding and managing the interrelated processes as a system. The key benefits are (i) integration and alignment of the processes that will best achieve the desired results, (ii) ability to focus efforts on the processes, and (iii) providing confidence to interested parties as to the consistency, effectiveness and efficiency of the organization. Principle 6: Continual improvement – Continual improvement of the overall performance of the organization should be a permanent objective of the organization. The key benefits are (i) performance advantage through the improvement in the organizational capabilities (ii) alignment of the improvement activities at all levels to the strategic intent of the organization, and (iii) flexibility to react quickly to the opportunities. Principle 7: Factual approach to decision making – Decisions which are based on the analysis of data and information are most effective. The benefits are (i) informed decisions (ii) increased ability to review, challenge, and change opinions and decisions, and (iii) an increased ability to demonstrate the effectiveness of the past decisions through reference to the factual records. Principle 8: Mutually beneficial supplier relationship – An organization and its suppliers are interdependent and a mutually beneficial relationship enhances the ability of both to create value. The key benefits are (i) increased capability to create value for both parties, (ii) flexibility and speed of joint responses to changing market or customer needs and expectations, and (iii) optimization of costs and resources. The ISO 9000 family of standards is related to QMS and designed to help organizations ensure that they meet the needs of customers and other stakeholders while meeting statutory and regulatory requirements related to the product. The standards are published by ISO, the International Organization for Standardization. ISO 9000 family deals with various aspects of QMS including the eight management principles on which the family of standards is based. The standards provide guidance and tools for companies and organizations who want to ensure that their products and services consistently meet customer’s requirements, and that quality is consistently improved. The ISO 9000 family of standards 2as first issued in 1987 and had the same structure as the UK standard BS 5750. Since then it is continually being revised by standing technical committees and advisory groups, who receive feedback from those professionals who are implementing the standard. ISO 19011:2011 – sets out guidance on internal and external audits of quality management systems. In addition to these procedures, ISO 9001:2008 requires the organization to document any other procedure required for its effective operation. The standard also requires the organization to issue and communicate a documented quality policy, a Quality Manual (which may or may not include the documented procedures) and numerous records, as specified throughout the standard. The requirements of the standard are covered in the following eight sections. The various aspects of QMS are covered under various sections of the standard. Two types of auditing are needed to become registered to the standard: auditing by an external certification body (external audit) and audits by internal staff trained for this process (internal audit). The aim is a continual process of review and assessment to verify that the system is working as it is supposed to; to find out where it can improve; and to correct or prevent problems identified. It is considered healthier for internal auditors to audit outside their usual management line, so as to bring a degree of independence to their judgments. A fully documented QMS ensures meeting of the following two important requirements. · The customers’ requirements – QMS gives confidence in the ability of the organization to deliver the desired product and service consistently meeting their needs and expectations. · The organization’s requirements – QMS meets both internally and externally and at optimum cost with efficient use of the available resources which are materials, human, technology and information. The benefits which an organization can have from QMS are given below. Thank you for every other informative site. The place else may just I get that type of info written in such a perfect manner? I have a challenge that I am simply now operating on, and I have been on the glance out for such information.